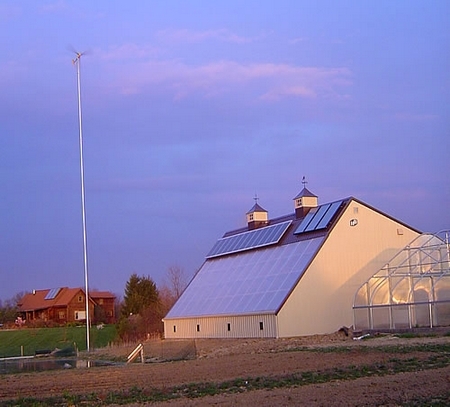 The sun and wind provide heat for the greenhouses and electricity to operate the equipment. We have built a renewable energy growing facility and a passive solar greenhouse to harvest a variety of fresh crops, through all four seasons in central Ohio. This biointegrated sustainable agriculture facility has been growing crops year-round (since 2005), off-the-grid using renewable energy, collected rainwater, and environmentally responsible growing methods. It is designed with specific areas for aquaponics (organic hydroponics and aquaculture), worm composting (vermicomposting), herb drying and food processing. Featured crops include fresh herbs, salad greens (arugula), specialty vegetables, and ornamental fish. Passive solar south facing clear glazing plus a roof mounted active solar thermal collector system with radiant floor heating/thermal curtain systems provides for winter heating. A 1.0 kW Bergey Wind turbine and 2.1 kW of solar photovoltaic panels will provide the power to operate the equipment. The greenhouse is an unheated structure with an east to west orientation and ground insulated to take advantage of solar heating and wintertime soil thermal mass. This allows for cool season crops during the winter and ideal growing conditions for extended season berry production. The pond designed for intensive production of fish, currently stocked with Mosquitoe fish. Indoor tanks grow ornamental koi available for retail sale by appointment only. Aquaponics tanks also with bluegill and perch. Welcome to clean energy food!